Elect REPUBLICANS To Save Beacon Hill From Floodwaters of Scandal & Corruption! Sick of the culture of scandal & corruption upon Beacon Hill?!?! Let’s start to electing some new blood & fresh faces to the state legislature! Since it’s past time for the Democrat primaries to do the job, let us strive to do whatever we can to elect our great slate of Republican candidates during Election Day this Tuesday! 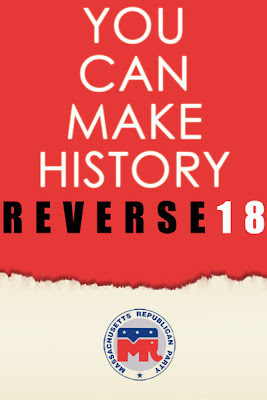 Please check out How YOU Can Make History: Reverse 18 for more information! Beacon Hill is once again awash in charges of political corruption, cronyism, and influence peddling, a spate of scandals that seasoned observers describe as perhaps the worst in three decades. And the sense that shoddy or criminal behavior has become pervasive is peaking just as the state confronts its worst financial crisis in years and needs strong leadership from its elected officials. [Democrat State] Senator Dianne Wilkerson seemed to think last week that her Senate colleagues would go easy on her. And she had reason. All her past indiscretions had been overlooked, and the collegial body that meets in a powder-blue room with cushy chairs has never tried to oust one of its own before a conviction for a crime. “I trust that you will act consistent with prior practice,” Wilkerson wrote in a letter to the Senate president. Members of the House and Senate – and the Massachusetts public – have already been subjected to a stream of news about the alleged ethical failings of [Democrat State] House Speaker Salvatore F. DiMasi and his close friends. As the taint of corruption settled deeply over the State House last week and subpoenas from the US attorney’s office were delivered to top-ranking state officials by the hour, Wilkerson’s Senate colleagues quickly moved to purge her. [Democrat Senate President Therese] Murray was mentioned in an FBI affidavit as being present at a closed-door meeting with Wilkerson and other leaders to broker a deal for more liquor licenses in Boston – five of which, Wilkerson allegedly claimed in FBI tapes, were hers to control. Murray, who has publicly denied she was at that meeting, also received a subpoena last week and is prominently mentioned in subpoenas sent to other government offices, including one to the state’s technology division demanding that her e-mails be preserved. [Democrat Rep. John H.] Rogers, too, is among those facing ethics allegations. He has been defending himself over an arrangement in which his campaign allegedly paid funds to a consultant who in turn made mortgage payments on a vacation home on Cape Cod owned by Rogers and his wife. In still another controversy brewing, in Central Massachusetts, [Rep.]Robert P. Spellane, a Worcester Democrat, and vice chairman of the committee that regulates banks, has been forced to explain how he was able to forgo a year’s worth of payments on a $340,000 loan from a local bank with an executive who supports him politically. And while the charges did not involve or conflict with his public duties, state Senator J. James Marzilli’s bizarre arrest on charges that the Arlington Democrat sexually harassed and accosted four women in downtown Lowell has only heightened the image that Beacon Hill is sliding out of control. The Senate has not expelled Marzilli, although it referred his case to the Senate Ethics Commission. There has been no action in the four months since the referral. He is not running for reelection.